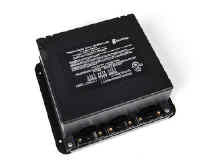 The 50 amp Transfer Relay is used to transfer the power source of a coach between the shore power and the generator. Power from the shore power cord is fed to the normally closed contacts of two contactors. This allows the power from both lines of the shore cord to pass through into the coach distribution panel. Power from the generator is fed to the normally open contacts and to a delay circuit on the printed circuit board. When the power from the generator is applied, the delay circuit senses the power from Line 1 and applied DC power to the contactor coils, after approximately 15 seconds. This pulls in the two contactors, applying the power from the generator to the coach. This unit can also be wired to act as a transfer between both lines of a 5.5KW or 6.5KW generator and a 30 Amp shore power cord.